When it comes to outdoor dining sets, childhood flashbacks of uncomfortable steel patio sets that left imprints on my legs is all that comes to mind. 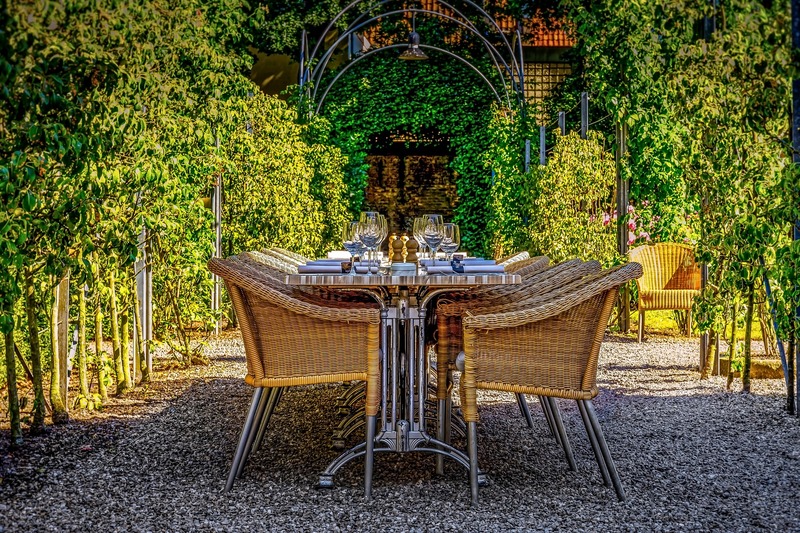 However in an era of outdoor eating, dining sets have now been developed to stand strong against the elements while still providing elegant style and supreme comfort. Check out the range of Outdoor dining settings from Domayne Australia and discover sets that look too good to eat off, let alone leave outside. This stunning outdoor setting showcases functionality and style with its most notable features being its durability and weather resistant make. With and tough yet sleek aluminum construction and steel legs, the Fior package can handle the mess of big family lunches and all of the seasons throughout the year. With easy maintenance achieved with a mild cleaning solution and powder-coated frames, this set is rust resistant and colourfast and is made with added protection for extended longevity. Its matte black chairs are contoured for comfort and support and elegantly match the deep charcoal and chocolate colour options of the table itself. Exclusive to Domayne, this outdoor dining set will make an effortlessly stylish addition to any entertaining area in your backyard. Obtain a modern and light coastal style with this gorgeous set that features a matte sand white finish that provides you with a minimalistic aesthetic allowing you to optimise the space available while still making a statement. With an elevated rectangular table and the ability to seat up to seven people, this unique table setting proves it delivers on both comfort and practicality. The table and chairs are protected against the elements with its layer of powder coated on the aluminium frame in a beautiful matte white. Bringing a deeper and more intricate design, the wicker-made Lido Set has a strong yet comfortable aesthetic, perfect for any yard. With the potential to seat up to seven, it has a configuration of a three seater lounge, two armchairs and two additional stools to be used as seats or foot-rests. This set provides versatility and comfort with a relaxed alfresco flair. The unique design is made from a rich fawn coloured wicker and is adorned with plush polyester cushions that give your guests ample seating space and comfort for hours. It’s natural yet refined design molds to any style and is as equally equipped to withstand the elements. For a simple yet detailed statement piece, the Clarke dining bench gives you a juxtaposition of sleekness and intricacy. With a wicker constructed frame matched with a refined glass tabletop, this set comes in a range of sizes to best suit your needs. Exclusive to Domayne, ‘WOW’ your guests with luxurious comfort thanks to its upholstered benches which are cushioned with memory foam to keep your guests relaxed and happy to be seated all day. Experience a new level of comfort with the Arcadia Balcony Set. For those who are looking for a dining set to seat only a few, the Arcadia Set is the perfect match. The lounge consists of a deliciously roomy escape for two with additional stools to be used as foot rests or more seating for a casual gathering. Its colour choice of taupe or white will complement neutral coastal styles and provide a light and airy feel to your backyard entertaining. Built with aluminium, this strong and durable frame is softened with the tempered glass tabletop. Ready to take on all the elements, this dining set features UV-resistant materials that won’t allow the table to be damaged by the harsh Australian summer. Experience the beauty of summer in your own backyard this year with the addition of a quality outdoor dining set. Bring friends and family around knowing they will be in incredible comfort and luxury while still being able to appreciate the stunning design and durability of your very own outdoor dining set.